Biomechanical Composition Workshop Tickets Available Now! In these hands-on workshops being held at Tattoo The Lou Fest in St.Louis, Missouri & The Hell City Tattoo Fest in Columbus, Ohio- Guy goes into detail about making the most of the human form in composing powerful flowing abstract designs to fit the body in a flattering way. He supports these fundamental compositional rules with suggestions for creating lighting, depth and texture while exploring the limitless graphic language of abstract biomechanical design. Following his presentation the class will get an assignment to draw in a human anatomical template while he walks around the class, comments and gives advice toward making the most of each of the students’ compositions with emphasis on flow, fit, contrast and overall visual impact. Approximately 2 hours, $200. 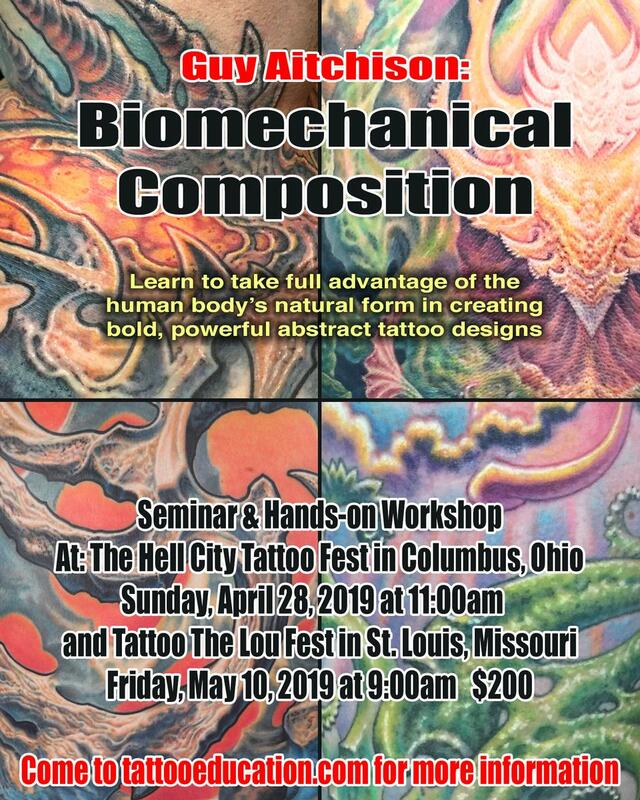 Click HERE to order Tattoo The Lou Fest Biomechanical Composition Workshop Tickets! Click HERE to order Hell City Tattoo Fest Biomechanical Composition Workshop Tickets!